Missoula Floods expert Gene Kiver interviewed by Nick Zentner CWU. IAFI field trips are popular with the public thanks to the many experts that volunteer their time. Gene Kiver, an Emeritus Geology Professor at Eastern Washington University, is one of the founders of the Ice Age Floods Institute. Nick Zentner interviews Lake Missoula Floods expert Gene Kiver. Karl Lillquist (CWU Geography) explains 1910 U.S. Geological Survey topographic map of Quincy Basin during IAFI field trip. This map helped spark J Harlen Bretz's interest in the channeled scablands. IAFI President Gary Kleinkenecht speaks during Ice Age Floods Trail press conference. Congressman Doc Hastings and Senator Maria Cantwell also pictured. Sec. D-8 and D-9 describe formation of Ice Age Floods Task Force and IAFI. In an interview recorded on June 3, 2009 at Central Washington University, Gene Kiver visits Ellensburg to recall the early days of the Ice Age Floods Institute. 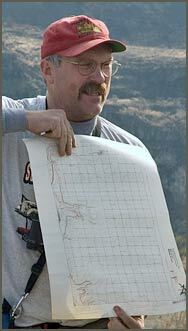 A former Eastern Washington geology professor who advised many graduate students (including popular author Bruce Bjornstad), Dr. Kiver spent decades mapping geology in eastern Washington with EWU Geography professor Dale Stradling. In the early 1990�s, Gene and others began talking about forming a group dedicated to sharing the Ice Age Flood story with the general public � and the Ice Age Floods Institute was born. In 2009, legislation for an Ice Age Floods National Geologic Trail � sponsored by U.S. Senator Maria Cantwell and U.S. Congressman Doc Hastings � was passed by Congress. Later in the interview, Gene discusses an upcoming book co-authored with former student Bruce Bjornstad. On the Trail of the Ice Age Floods: The Northern Reaches is a follow-up effort to Bjornstad�s On the Trail of the Ice Age Floods: A geological field guide to the Mid Columbia Basin first published in 2006. In Volume 2 to be released soon by Keokee Books, Bjornstad and Kiver focus on the Channeled Scabland, where the evidence for megafloods is most striking and dramatic. 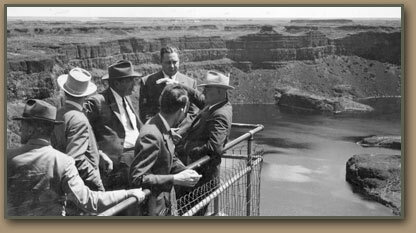 It was in the Channeled Scablands early in the 20th century where rebel geologist J Harlen Bretz first saw most clearly, and described most eloquently, the evidence for these Ice Age cataclysms that so violently transformed the region. Coauthors Bjornstad and Kiver present dozens of trails and tours directing readers to experience, firsthand, the striking aftermath of the cataclysmic Ice Age floods. Late in the interview, Gene reflects on his exploration adventures at the summit of Mount Rainier. Instead of the usual mountaineering exploits, Kiver and a small team in the early 1970�s mapped an elaborate system of steam caves underneath Rainier�s summit glaciers . Dr. Kiver also reflects on his long teaching career in the Geology Department at Eastern Washington University in Cheney. 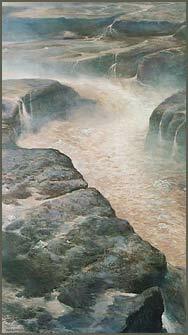 Image from Rufus Woods Collection (CWU) shows early scabland interpretation. 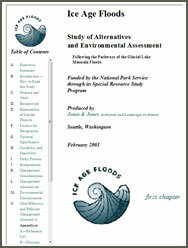 Efforts by Kiver and others in the early 90s led to formation of the Ice Age Floods Institute - an organization dedicated to telling the story of the Ice Age Floods. Geologists Bruce Bjornstad and Gene Kiver hiking in lower Palouse River Canyon. 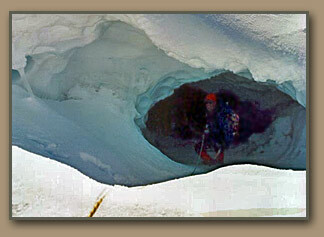 Tom Foster explores entrance to Rainier's summit steam cave system. Kiver's team studied and mapped the caves in 1971. USGS Volcanologist Tom Sisson discusses the Cascade Volcano Observatory, Rainier's volatile history, and current research efforts to learn when the next eruption might occur. 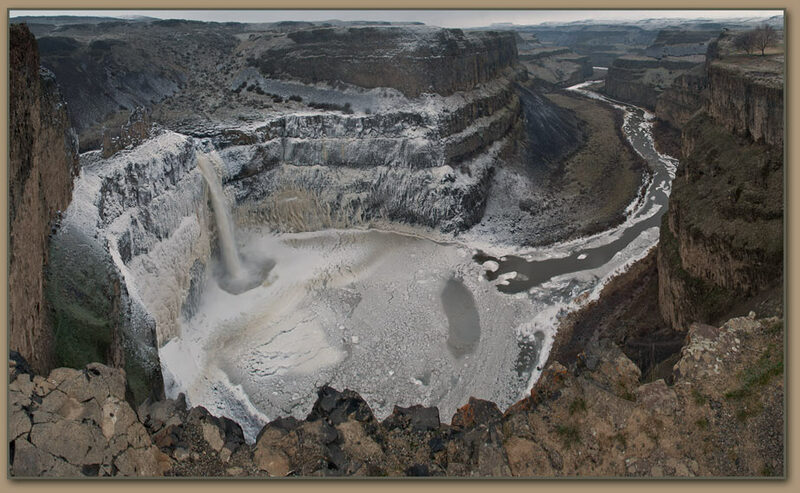 Palouse Falls and Palouse River Canyon in Winter. Taped on the campus of Central Washington University and hosted by CWU Geology Professor Nick Zentner, 'Central Rocks' is a series of interviews with geologists who teach or conduct research in Washington. 'Central Rocks: Roadside Geology', a new spin-off project, is a series of short films that feature familiar locations along Washington's scenic highways. CWU Geology Professor Nick Zentner lectures on eastern Washington's unique landscapes (Floods of lava and floods of water). All photos by Tom Foster unless otherwise noted. Screenshots courtesy "Central Rocks"